Dr Erica Seccombe with her two prizes. Photos: Ian Bushnell. 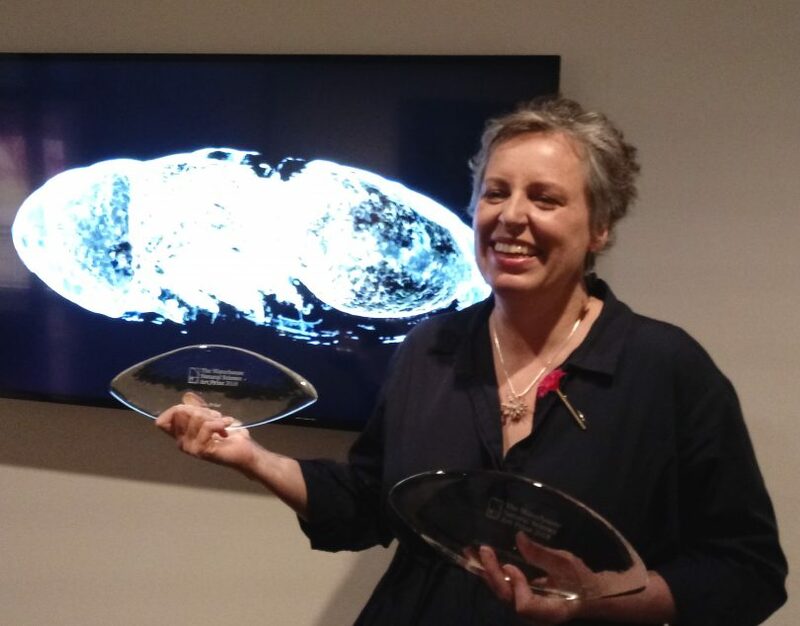 Canberra can now lay claim to also being the creative capital after two ACT artists who are products of the ANU School of Art took out categories at their first attempts in the prestigious 2018 Waterhouse Natural Science Art Prize. The Waterhouse Natural Science Art Prize, from the South Australian Museum, attracts high-calibre entries from around the world and encourages discussion about scientific and environmental issues facing the planet. Seventeen winning and highly commended works are on show at the National Archives of Australia at Old Parliament House from 23 August 2018 to 14 October 2018. It is the first time that a video has won the Open category, and it also won the Science Choice award. Dr Seccombe, an interdisciplinary artist and resident teacher at the ANU’s Department of Applied Mathematics and Vizlab, National Computational Infrastructure since 2006, admits her high-tech, time-lapse work is questioned by some in the arts world. “It falls between the cracks slightly of not being science because I’m not trying to explain science but it plays with a very different field of the arts which is very interdisciplinary and research-based. When I try to promote it I get a lot of shut doors but there are people who really get it,” she said. Including the judges, who said her work profoundly captured the spirit of the prize with an entry that “took as its foundation the ordinarily unseen intersection between science and art”. Dr Seccombe comes from a printmaking background but works with frontier scientific instruments and software, and this project has been based on an interdisciplinary project that has been building for about 10 years. She at first wanted to profile the transformation of a caterpillar but she moved away from that ‘cliche’ after an arts residency in London at the Natural History Museum, where there is a big forensics program and where she learned about how flies are very important in calculating exact times of death because they land on corpses with half an hour of people dying. Her next project will be to x-ray the moon rock given to Australia by NASA after the 1969 moon landing as part of next year’s 50th anniversary. Hayley Lander loves Canberra, its landscape and its eucalyptus species. 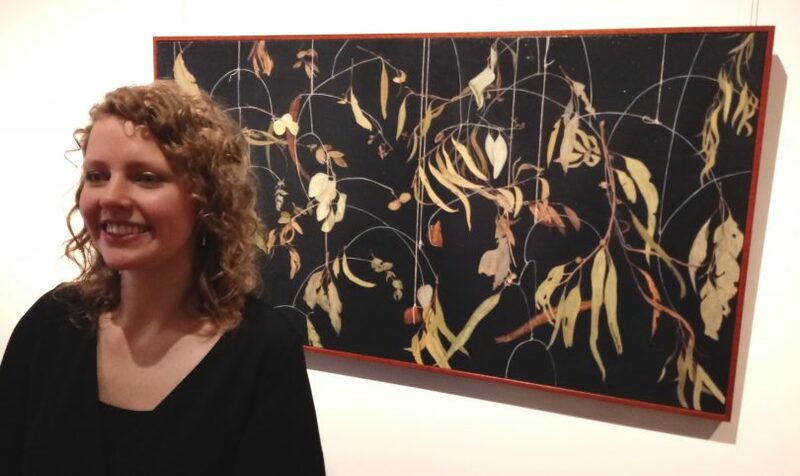 Ms Lander, a painter who graduated in 2014 and works at the National Gallery of Australia, loves rambling in Canberra’s outdoors collecting fragments from its landscape such as leaves or even the stamped Canberra bricks that are so much a part of the capital’s story. The oil on board (yes, it’s eucalyptus) painting depicts the gum leaf mobiles hanging in her studio, that she has created from her gathering. She admits to an obsession with the many species of eucalyptus and their amazing variety. “The eucalyptus has had such a huge impact on our history, social history, economic and also our way of thinking about ourselves, our social identity. I love being able to express such a broad range of ideas through this one species,” she said. She said using a wood surface added an extra layer to the work because it also involved the species you’re representing as well. The painting was a painstaking process that took eight months and involved constant layering until she had ”captured the essence of every little subject matter”. She will continue working with her beloved eucalyptus, as well as those Canberra bricks, but for now, she is basking in an achievement way beyond her youthful expectations. 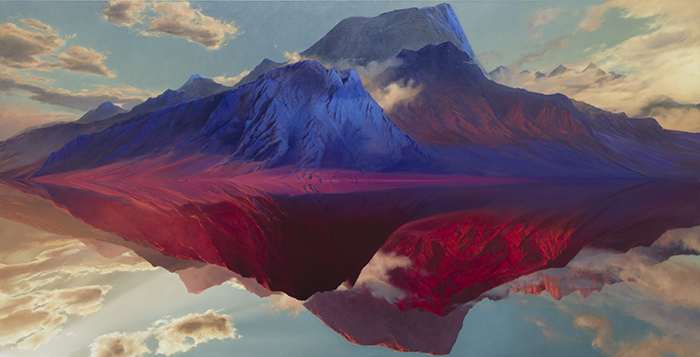 People’s Choice: Jason Cordero’s The question has been answered, oil on linen. National Archives Director-General David Fricker said: “We are thrilled to host the popular Waterhouse Prize once again, the only location outside Adelaide to do so. We will be holding the exhibition at Old Parliament House this year while we wait to move back to our permanent East Block home in 2019.